GIVEAWAY NOW CLOSED! Go here to see winner. It’s your last chance to enter this giveaway. It ends tonight at 11:59 PM EST. Make sure you’ve entered and shared the giveaway with your friends so they can enter too! Good Luck Everyone! ﻿﻿As soon as I recieved the cookbook and opened it I knew I was in love. Not only have they shared 200 slow cooker recipes in this book, but they’re sharing tips, shortcuts and slow cooker findings. This is truly the perfect slow cooker cookbook for the beginner and the expert. Believe it or not, the very first chapter is titled “Slow Cooker 101”. 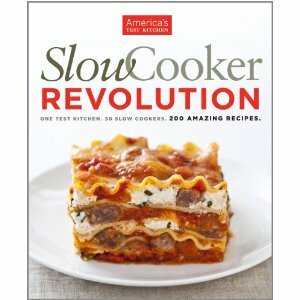 They truly cover all the bases in this cookbook proving that there is a Slow Cooker Revolution. Where do I begin to tell you about the wonderful slow cooker recipes? Well, let me try here… they have breakfast recipes, soup recipes (using ramen noodles in some no less), dessert recipes and the best slow cooker cassoulet recipe I’ve ever seen! This is a great cookbook to have in your arsenal for utilizing your slow cooker on a regular basis. Mandatory Entry: Leave a comment below sharing what you’re favorite slow cooker meal is. 1 ENTRY – Like Crock Pot Recipe Exchange on Facebook and leave a comment here that you did. 1 ENTRY – Like America’s Test Kitchen TV on Facebook and leave a comment here that you did. 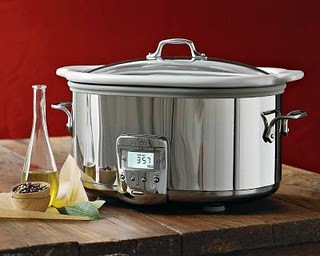 1 ENTRY – Follow Crock Pot Recipe Exchange on Twitter and leave a comment here that you’re a follower. 1 ENTRY – Follow America’s Test Kitchen on Twitter and leave a comment here that you’re a follower. 2 ENTRIES – Give Crock Pot Recipe Exchange a “thumbs up” at Babble’s Food Mom Blogs, 2011 and leave a comment here that you did (you should be able to do this once a day, leave a comment for each day that you do this). 1 ENTRY – Follow Crock Pot Recipe Exchange on Google Friend Connect and leave a comment here that you’re a follower. Please remember to leave a seperate comment for each entry. I want you to have a fair a square chance of winning 🙂 If you’re already a facebook or twitter follower of Crock Pot Recipe Exchange OR America’s Test Kitchen don’t forget to leave a comment saying that too-you don’t have to be a new follower to receive an extra entry. ﻿The giveaway will end on Thursday, March 10th at 11:59 PM EST. All entries will be verified, and please remember you must do the mandatory entry before you can gain extra entries into the giveaway. This giveaway is for continental US residents age 18 and over. If you absolutely can’t wait to see if you’re the winner, go here to purchase it now.